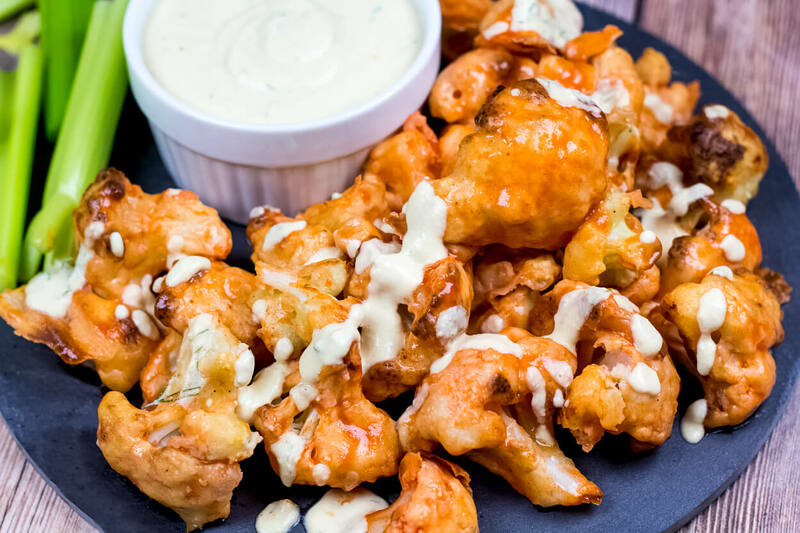 Addictive Vegan Cauliflower Wings that are spicy, meaty, and super addicting. A fun appetizer or side to serve alongside homemade burgers and fries. I bet you can’t eat just one! Who is watching the Superbowl or This Is Us tomorrow (or both)?! I love cooking up fun appetizers and hearty foods for game day. I have to say, This Is Us is definitively my favorite show on TV right now – despite the fact that I BAWL my way through every episode. Tomorrow night, I’ll be munching on these healthy, plant-based wings and hoping for the best with tomorrow’s episode. 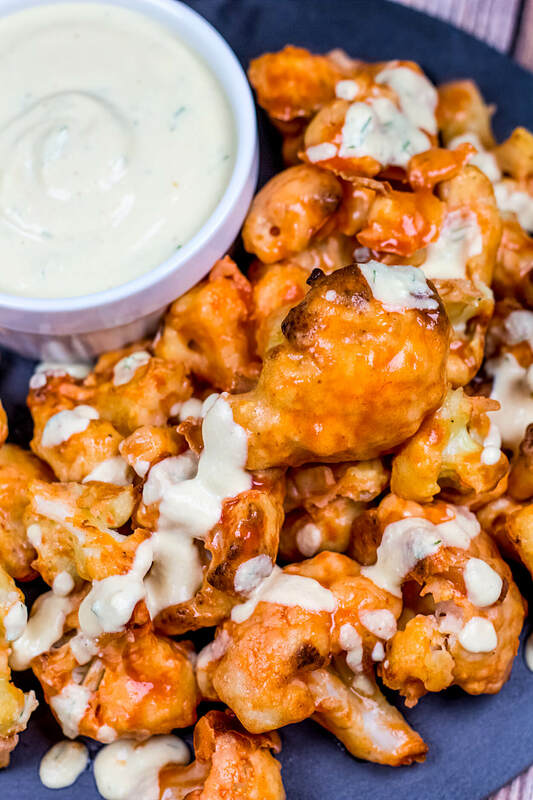 These addicting and HOT Vegan Cauliflower Wings are super meaty and fun to make (and eat!). Made with only 8 simple ingredients, you’re only 35 minutes away from serving up homemade, plant-based wings with a real K-I-C-K.
First, whip up a simple (and tasty!) batter. I use organic all purpose flour in my batter but you can sub gluten-free flour if you need this recipe to be gluten-free. BAKE, toss in Buffalo Hot Sauce, and bake for just a few minutes more. 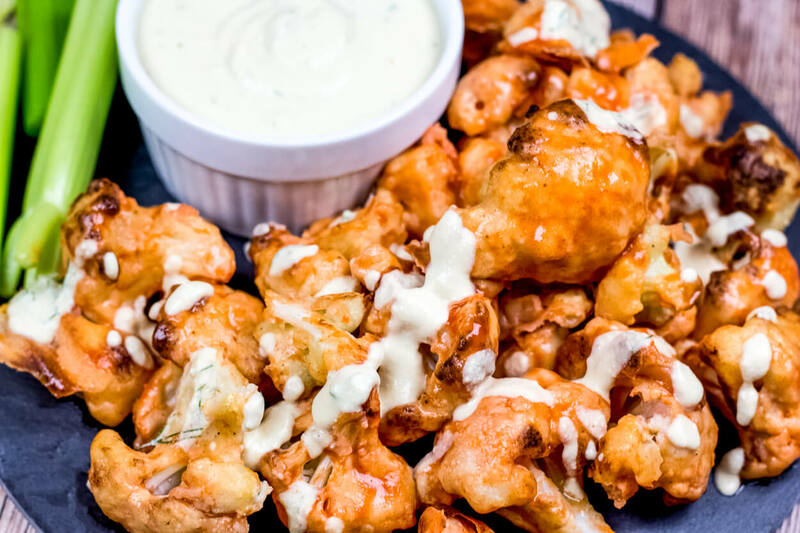 I top my Vegan Cauliflower Wings off with Plant-Based Dill Cheese Sauce. Because YUM. And serve with fresh, celery sticks! Enjoy. If you make these Vegan Cauliflower Wings at home, snap a photo and tag me #CearasKitchen on Instagram or leave your feedback below! Preheat oven to 450F. Line a baking sheet or pizza stone with parchment paper. Combine the flour, garlic powder, onion powder, and black pepper in a large mixing bowl. Add aquafaba and whisk until just combined. 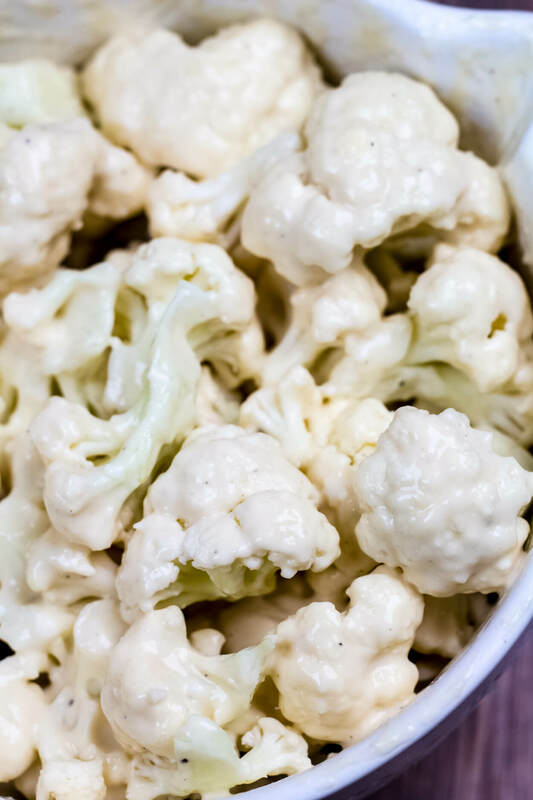 Dab chopped cauliflower with a paper towel – make sure it’s completely dry before tossing in the batter (this will help your cauliflower wings become extra crispy!). 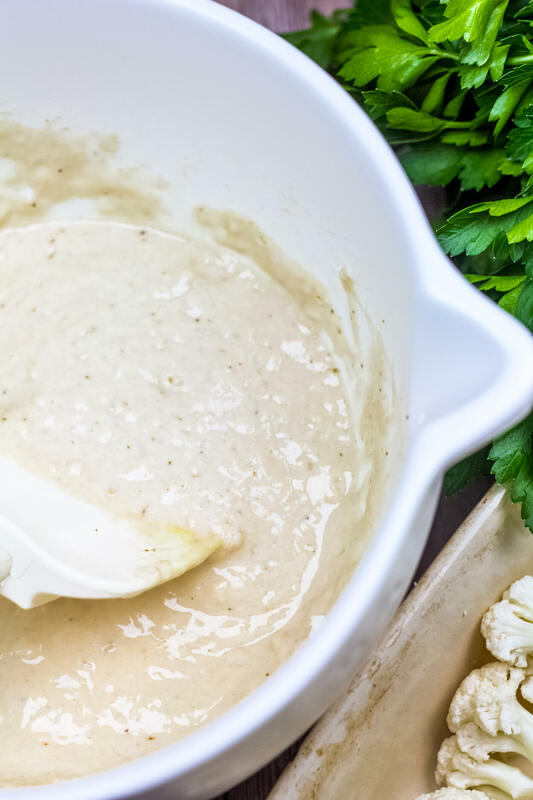 Toss the cauliflower in the batter until completely coated with the batter. 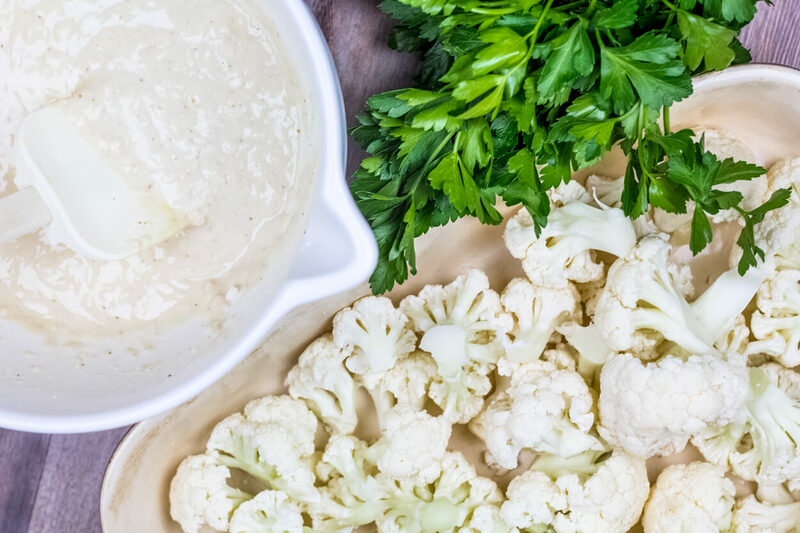 Lay cauliflower flat on the baking sheet. Make sure the cauliflower is not too close together or it won’t crisp up. Bake for 22 minutes until crispy. 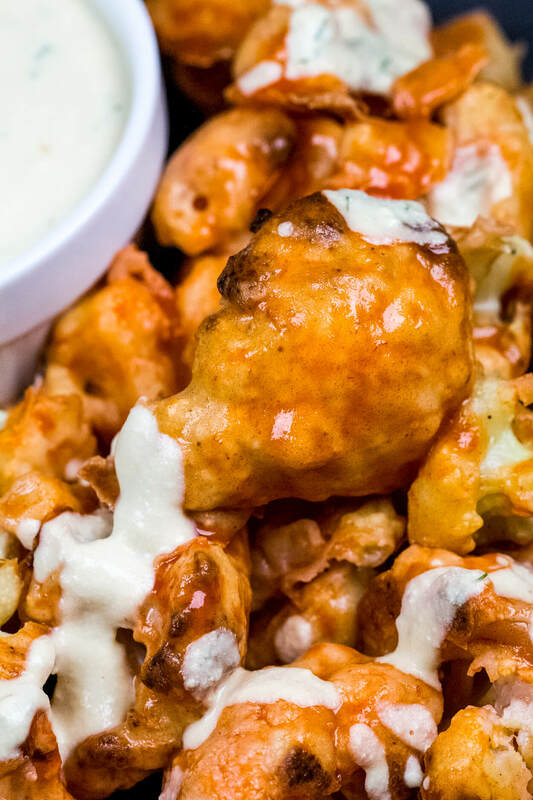 While the cauliflower wings are baking, mix the hot sauce and maple syrup in a small bowl. Pour the hot sauce mixture over the baked cauliflower. Continue baking for an additional 5 to 8 minutes (I recommend broiling for the last two minutes for extra crispiness!). Serve alongside with dill cheese sauce and celery. Enjoy! Loved this but used pastry flour and apple sauce. Dipped using PD buttermilk ranch. 2 cauliflower heads was almost too much, we’ll cut down next time for crispier eating. We’ll use the leftovers for buffalo salads. Hi! Could you add the nutritional information in here? Made these cauliflower wings for my family and they devoured them! !